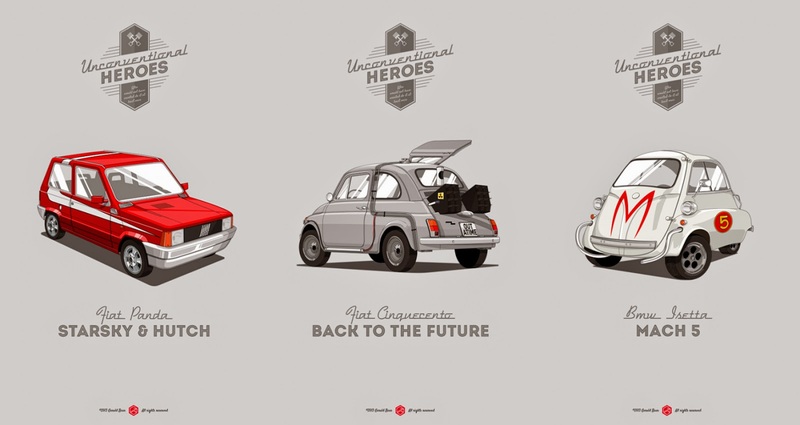 ERDEM KOCAOĞLU: What if the DeLorean in ‘Back to the Future’ was an Old Fiat? What if the DeLorean in ‘Back to the Future’ was an Old Fiat? If Marty McFly tried speeding back to the future in an old Fiat 500 instead of a DeLorean, would he even make it to 88.8 miles per hour? It’s questionable. Graphic Designer/Illustrator Gerald Bear’s great new series, Unconventional Heroes, imagines a world where the cars in our favorite cult films and television are a lot less super… and far, far smaller. Using mostly tiny mid-century european vehicles, each vintage set of wheels is a perfect tribute to the original. From a BMW Isetta for Speed Racer’s Mach 5, to a Vespa for Akira’s slick motorcycle, all the iconic paint work and accessories are included. It’s fun to imagine a film where these vehicles would fit in, perhaps with our heroes trying to eke out a living in some small cafe or circling the city trying to find a parking spot… in between saving the day of course.